If you are a fan of the classic ’60s TV show The Munsters, you know all about this “typical American” family, including their strange friends (Wolfman, Creature from Black Lagoon, etc), the mansion, the family hot rods (Munster Coach and Dragula), and even the family pet Spot. But what you might not know is that all of this has been recreated in exacting detail by Sandra and Charles McKee in Waxahachie Texas! They started by building – from scratch – the Munster Mansion. It’s not just a prop – it’s a real house and they actually day-to-day live in it. It was purposefully built from the ground up to be exactly as the real house would have been. Of course the exterior of house used in the TV show was a facade – the interiors were on a sound stage. So the McKees set out to build the real thing, in amazing detail taken from watching the show hundreds of times, measuring everything possible, calculating dimensions from measuring the strides of the actors, etc. They have also reproduced every other single thing that could be discerned from the show – all the rooms, the furnishings, everything seen in the show as props, hundreds of items. Even the spider webs and dust. It’s incredible. 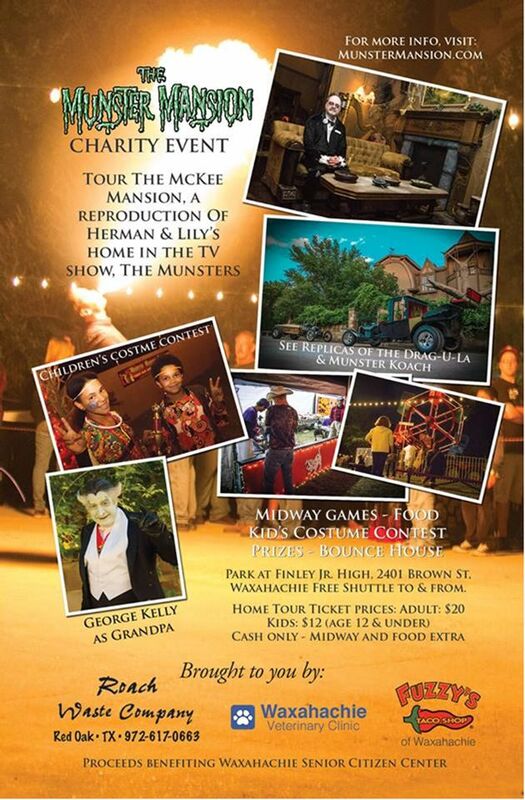 Every couple of years they very generously open the house and grounds for a 2-night charity event. 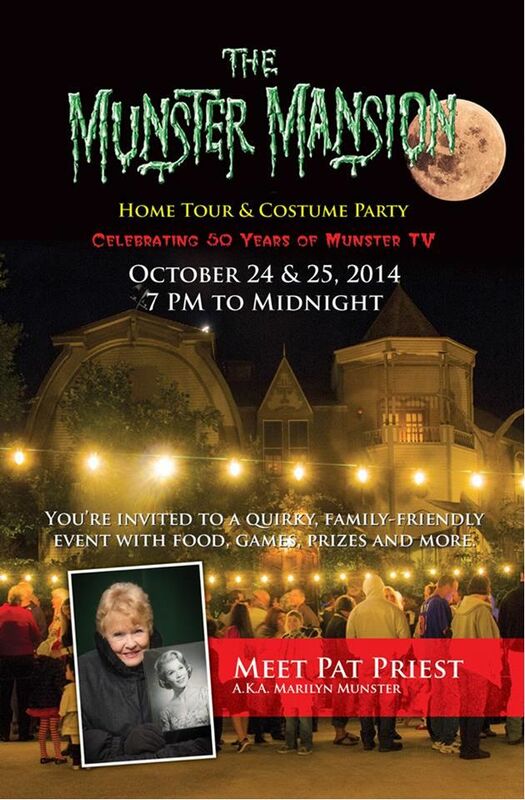 The surviving actors from the original show participate… in 2014 it was Pat Priest who played the “plain” daughter. The McKees themselves dress as Lily and Herman, a friend from PA plays Grandpa (the original Al Lewis was here before he died), and volunteers are dressed as all sorts of similar TV and movie characters. The McKees are superfans of The Munsters and the attention paid to their exact reproduction of the elements is amazing. Our first visit to the Munster Mansion was in 2007, where we could barely believe our eyes at the attention to detail. But of course it’s the two Munster hot rods that attract us as car enthusiasts. We’ve covered the original cars of the show before. And since then the McKees have built fully functional replicas of both the Munster Coach and DRAG-U-LA. Driving enthusiasts will recognize them both since the original Munster Coach was built by George Barris. Like The Munsters, George Barris was an icon of the ’60s. Let’s start with some of the images from the 2014 event. First, the Munster Coach itself, along with video of it starting. Watch as Herman starts up this fully functional recreation of the Munster Coach ! And then there is DRAG-U-LA, ostensibly Grandpa’s car but both drag raced and (back) road raced by Herman. This dragster is built form a coffin and is powered by a Chevy small block. We heard a story that was new to us about the creation of the original car. In California at the time, it was illegal to purchase a coffin unless you were a registered mortician. So a deal was made with a funeral house for a coffin, and it was left outside where it then conveniently “disappeared” overnight. And DRAG-U-LA was born. The event itself was attended by thousands of people over two days. The highlight was meeting the characters, as well as an original actress from the show Pat Priest. Pat played the daughter “Marilyn”, who was the only one that we would consider “normal”, but who was considered by the other characters as “the plain one” for her obvious birth defects: she wasn’t a monster. Pat is in great shape after all these years, and graciously greets fans and signs autographs. Lily Munster, Herman Munster, and Grandpa. The house is always a highlight of the visit, and a long line formed each night to tour the interior (where, unfortunately, photos were not allowed).